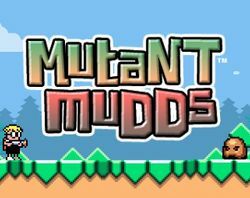 Mutant Mudds is a 2D platformer by Renegade Kid, inspired by 8 and 16 bit classics such as Mega Man. It stars Max, a boy armed with a water gun and water-powered jetpack, who has to fight an invading force of Mutant Mud monsters. Although in many ways a traditional platformer, Mutant Mudds has a few elements that distinguish it from other games. For one, the game takes place in three planes: the conventional plane, the background, and the foreground. Players can change planes using special pads or can be knocked from one plane to another by enemies. Another unusual aspect of the game is the health system. Although Max starts each level with three hit points, and has an unlimited number of lives, there is no way to regain health mid-stage. This page was last edited on 30 May 2016, at 13:28.